We didn't get any snow days last year which is rare in Ohio, but we got a 'freezing rain' day today so I'll take it!! Since I was already up (and ready for school) I thought I would go ahead and post my Fantabulous Friday Freebies that I used this week. 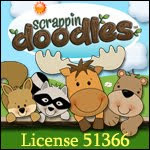 These are not freebies that I have created, but found on TpT and thought they were so great I had to share. If you use them, make sure to leave some wonderful feedback! We played Scoot for the first time this year. I'll be honest...I was a little nervous about playing with my big class this year, but they were awesome!! I told them it was going to take great listening skills to play and they were totally on target. I will be finding more scoot games for sure! 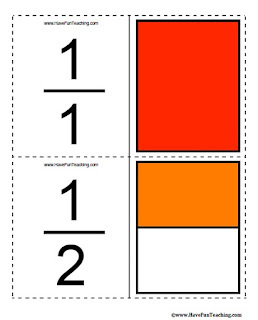 We also used these fraction flashcards for a quick practice. Some of my kiddos have trouble remembering 1/2 is one-half and not one-two so going through these flash cards was a quick reminder. They do go up to 12/12, but I didn't go up that high! I also found this Roll, Slide, and Cover game. My kiddos will play this as one of their Math with Someone games during the month of March as a review. The directions are given in the description. I hope you can enjoy these freebies! Enjoy your weekend and snow day if you're off today too! Hi Rachel!! 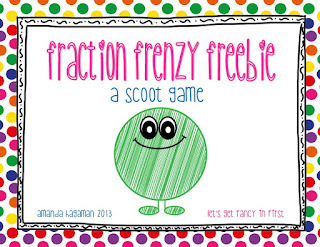 Thanks so much for the shout out about Fraction Frenzy! I'm glad your kids had fun with Scoot ... I was totally nervous about trying it out too, but I think sometimes they are way more motivated to listen when they're doing something fun :) A place value Scoot game is on my (LONG! hah!) to do list ... I'll let you know when I get it out! Wow, those are great freebies! Thanks for sharing... 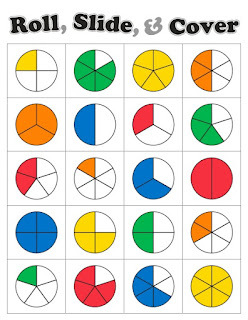 I start my fraction unit in a few weeks and those will come in handy! I teach in Ohio, too, and we got our first snow day in two years a few weeks ago! So exciting!